IPPL Founder and President Emeritus, Shirley McGreal at IPPL’s gibbon sanctuary. When I think of all that you have accomplished through IPPL, I am truly full of admiration. You have helped not only thousands of primates, but also brought hope to all those who care about them and their suffering at human hands. A global citizen, Dr. Shirley McGreal was born and raised in England but received her doctorate in India. She lived in Thailand, France, and various parts of United States (Illinois and Ohio) before settling in South Carolina at the gibbon sanctuary she established in 1977. Originally planning on a career as a college teacher, Shirley was unexpectedly drawn into a more adventurous life. While living in Thailand in the early 1970s, Shirley witnessed firsthand something she never forgot: dozens of snow-white wild baby monkeys confined to cramped cages, their helpless arms outstretched to passersby. They were infant stump-tailed macaques, their mothers certainly shot to procure them, and they were being held at the cargo area of the Bangkok Airport awaiting transport to some dim laboratory overseas. Later, walking through the Bangkok Sunday markets, Shirley also saw wild baby gibbons, alone in their pathetic cages; they had been captured for the domestic pet trade, even though these same animals would typically be discarded by their owners after reaching maturity in a few years. Shocked by the deplorable conditions under which these animals were being captured, transported, and exploited, Shirley began to investigate the plight of the world’s primates and soon discovered that the matter went beyond animal cruelty. As a result of unsustainable and illegal trading practices, many primate species were being dangerously depleted. She also discovered that no organization worked to protect all primates, great and small. Although large apes like chimpanzees, gorillas, and orangutans had (and will always have) their dedicated fans, there was no organization that seemed interested in helping the “plain” monkeys, too, whose sufferings often went unnoticed by the rest of the world. In 1973, she transformed her concern into action and formed the International Primate Protection League (IPPL). In her role as the leader of this organization for decades, Shirley has worked tirelessly at the grassroots level to protect all primates from the abuses she had seen at human hands. Thousands of primates around the world are alive and thriving today thanks to Shirley’s dedication. As a result of her work confronting international animal smugglers, she has gone undercover to investigate primate smuggling rings and laboratories, received death threats from illicit animal dealers, and been the target of groundless (but expensive) lawsuits. From 1979 through 2010, she participated in all of the Conferences of the Parties to the Convention on International Trade in Endangered Species (important gatherings that help determine which species will be accorded special international protections), as well as numerous meetings of the International Union for Conservation of Nature (IUCN) and the International Primatological Society. Her gift for languages has been an asset in these international activities: in addition to English, she speaks French, Spanish, and some Hindi. Shirley has also involved IPPL in productive relationships with other grassroots nonprofit sanctuaries and pro-wildlife advocacy groups located in countries around the world, particularly where primates are native. Shirley feels that it is important to encourage cooperation between animal and environmental organizations both at the grassroots level and on a global scale. In 2004 she received the ChevronTexaco Conservation Award for her tireless efforts to make the world a safer place for primates. She was nominated to be an Animal Planet “Hero of the Year” for 2007. In 2008, she was pleased to receive the first Caroline Earle White Award from the American Anti-Vivisection Society. As a British citizen, Shirley was particularly honored to receive, from the hands of Queen Elizabeth II herself, the Order of the British Empire in June 2008, “for services to the protection of primates” in a ceremony held at Buckingham Palace. She was presented with a Lifetime Achievement Award for her “many years of service to wild and captive primates worldwide” by the North American Primate Sanctuary Association in 2014. Shirley is also an Honorary Life Member of the Wildlife Society of Bangladesh and Honorary Fellow of the Indian Society of Naturalists. Shirley has often been quoted, and her work has been reported and praised on Web sites and in newspaper articles and magazines around the world. In 1993, for instance, People magazine featured her as one of its “People of the Year” in its “Above and Beyond” section. 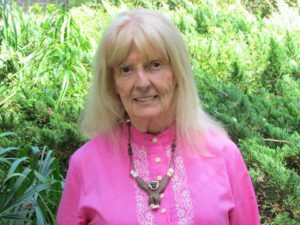 And one long-time IPPL supporter submitted a description of Shirley as an Earthkeeper Hero on the My Hero Web site, an online project that aims to inspire children with positive role models drawn from many walks of life. Of all her commendations, though, Shirley is perhaps proudest of the small plaque that hangs on IPPL’s office wall: the plaque was presented to her in 1994 by the Interpol Wildlife Crime Group/Dutch Police League in honor of her work in exposing an international ring of primate smugglers that had been responsible for (among other crimes) attempting to smuggle six young orangutans, as well as a mother siamang and her infant, via Bangkok Airport. Shirley continues to live on the grounds of the IPPL Headquarters Sanctuary. There, she is surrounded by big dogs—she is keen on Newfoundlands and Great Pyrenees and has helped rescue a number of canine companions—as well as some adorable Asian short-clawed otters. She has loved this species ever since living in the animals’ native Thailand, and there has always been at least one of these lively little creatures at the sanctuary. Shirley also is fond of all opera, rich desserts, and almost anything French! But her greatest daily satisfaction lies in being always within call of the dozens of gibbons whose lives she has saved.